Christmas lights are a great way to express not just your personality, but your enthusiasm for the holiday season. Along with this holiday cheer, however, the season can also bring rain. No need to let this ruin your holiday. Simply take the proper precautions to ensure the safety of your holiday light display, your home and yourself. Buy lights that are waterproof or rain-resistant. Many environmentally friendly lighting alternatives are widely available and more durable than traditional incandescent bulbs. LED (light-emitting diode) lights use electricity, making them susceptible to water damage, but they are much more resistant to leaks than traditional incandescent bulbs. Solar lights are another alternative. They remain cool to the touch, meaning that cold rain will not cause the bulbs to burst as hot bulbs might. All outdoor Christmas lights should carry a red Underwriters Lab (UL) holographic tag. This tag indicates that lab engineers have evaluated samples of the product to ensure they adhere to UL and American National Standards Institute standards. This organization also tests the lights under rainy conditions to determine whether they might short-circuit or cause a fire if wet. Many homeowners take great pride in their distinctly crafted Christmas lights display. Therefore, they create protective plans for these displays when rain looms. 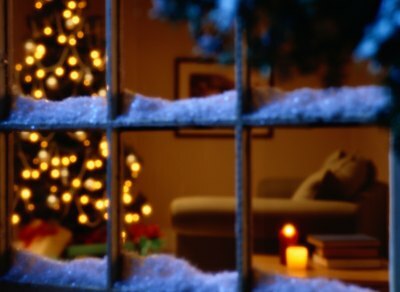 The easiest and most common way to protect a light display, aside from turning it off and unplugging the wires, is to cover the lights. Large light-up displays, such as Santa and his reindeer, can be moved inside. Strands of lights that are strung along a home's awning can be covered by throwing a large tarp over the roof. 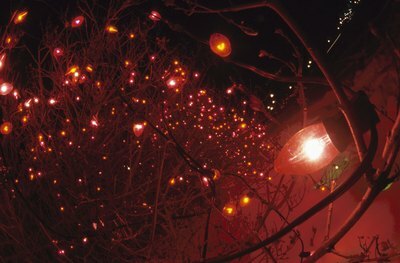 Medium-sized light displays that are difficult to move, such as lollipops or candy canes that are driven into the ground, can be covered by tying a plastic grocery bag over their tops. If your outdoor light display is plugged into outlets inside the home or garage, this doesn't guarantee that the lights are safe from the outdoor elements. Check the ceiling, floors and walls around the outlets to ensure that they are not leaking or pooling water. Don't plug lights into outlets in heavy indoor-outdoor traffic areas where umbrellas, heavy coats, rain boots and animals will track in water. Invest in ground-fault circuit interrupters (GFCIs) for any outlets that will supply power to outdoor lights. Many homes built within the last 25 years have GFCIs, which cut off the power from an outlet if there is a leak in the power cord. 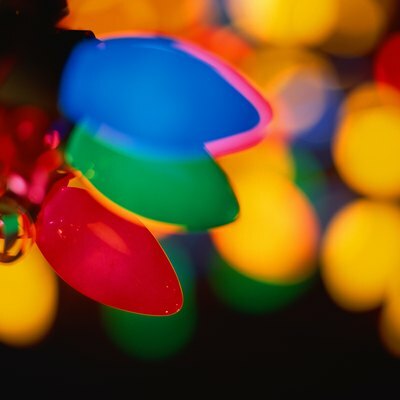 You can also keep your light displays--and your family--safe by using only heavy duty three-pronged extension cords that are approved for outdoor use. Be sure these cords stay cool and dry. 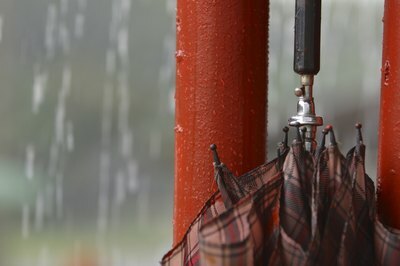 Whenever possible, keep them off the floor to prevent water from pooling around them on rainy days.